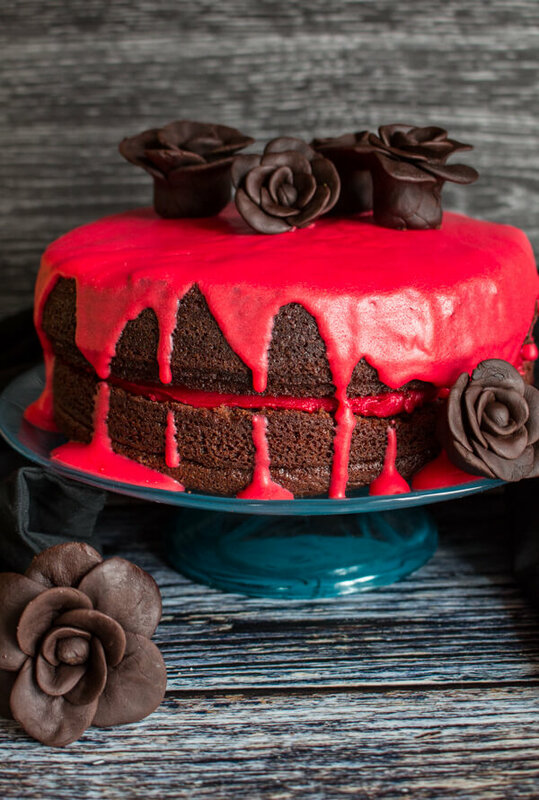 This really is a Bloody Good Double Chocolate Halloween Cake, a deliciously moist chocolate cake, a creamy butter cream filling and an amazing white chocolate Ganache. Halloween, scary but yummy! I love Halloween so needless to say when I got the opportunity to take part in Alison from Cupcake Diaries’ 30 days of Halloween series, I jumped at the chance! This is my first year participating in the Series and I am really excited to be sharing my Double Chocolate Halloween Cake. I wanted to make a classier Halloween Cake, you know the kind the “Count” might have liked to serve. When I think about how many times I watched Dracula movies with my Dad and how many times I read the book I just knew it had to be Bloody Good and really Red! I actually got the idea after I did a Cake Decorating Course at Sugartiers a Bake Shop just outside of Toronto. We were taught how to decorate with Fondant and to tell the truth I was totally intrigued by these gorgeous roses. I knew I had to somehow include them in a dessert, considering this was the first time my usual non-existent decorating skills actually surprised me! On my way home after the course I got this Halloween Cake Idea in my head. 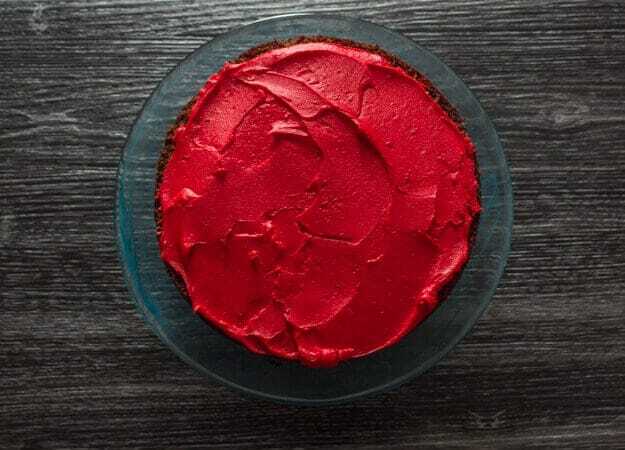 I decided I was going to make a Dark Chocolate Cake with a Butter Cream Filling and a White Chocolate Ganache which I was going to colour both a Deep Blood Red. And my new skill, five or six Black Roses were going to decorate this Double Chocolate Halloween Cake. Isn’t it wonderful when something you imagine actually comes out the exact same way, or sometimes if you are lucky even better. Especially when it tastes amazing too! This Chocolate Cake was really easy to put the together. But I just loved the Rose idea and I didn’t want you thinking “oh no too difficult for me”, because trust me if I can do it so can you. So in order to help you with your Fondant Roses I decided to make a DIY video with the help of my wonderful cousin Janet, and yes she also had a hand in making this cake. From making the delicious Butter Cream Filling to getting the Ganache to drip the way it was suppose too and of course to lending her hands in the video, this was her first try too. Thanks xoxo. This Halloween if you want something to serve the kids you could make my Halloween Mummy Giant Chocolate Chip Cookie and the adults could have a slice of this Bloody Good Double Chocolate Halloween Cake. Enjoy! Remember to keep your Fondant covered in plastic so it doesn’t dry out! 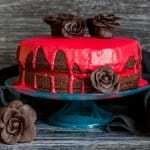 A Delicious, Decadent, Easy Double Chocolate Halloween Cake, Chocolate Butter Cream filling and Ganache makes this cake the Ultimate Dessert. Pre-heat oven to 350°, grease and flour 2 - 9 inch cake pans. In a large bowl whisk together sugar, flour, cocoa, baking powder, baking soda and salt then add the eggs, milk, oil and vanilla beat for 2 minutes on medium speed, then add boiling water and stir to combine (do not beat, batter will be thin). Pour into prepared cake pans and bake for approximately 30-35 minutes. Remove from oven and let cool 10 minutes in cake pans then remove to a wire rack to cool completely before frosting. Beat together sugar, vanilla, butter and milk until fluffy. 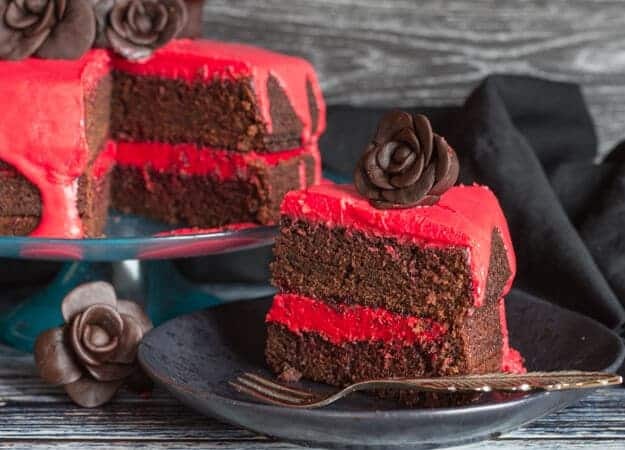 Add red food colouring while beating to reach desired colour. Place chopped white chocolate in a heat proof bowl, heat cream and milk until hot but not boiling, pour over white chocolate and mix until smooth, mix in red food colouring to reach desired colour. Let cool and thicken. 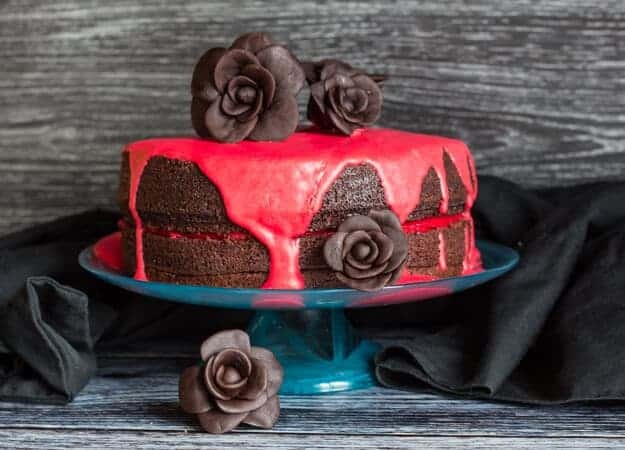 Level off the tops of the cake to make them flat **, fill the middle with the butter cream filling, top with second cake and pour cooled and thickened chocolate glaze over top to drizzle (if ganache is too thick add a little warmed milk to thin), decorate with Fondant Roses. Enjoy. Need to convert to measurements in grams or ounces….can you help here? Also can use other fat other than vegetable oil….it never agrees with me? Hi Helen, the recipe has been converted, I have only made this cake with vegetable oil although you probably could substitute with melted butter (make sure to cool it before adding to the other ingredients) hope that helps. In the recipe there is written 1/2 vegetable oil (is it Cup, teaspoon, table spoon)? Very ghoulish! I love the cake it is perfect for Halloween. Do you celebrate Halloween in Italy? Have a great weekend. Thanks Marisa, we have just started to celebrate Halloween in Italy in the last few years. Love that cake! I love that it the perfect Halloween cake for an adult party. So many Halloween treats are aimed at the kids (as they should be!) but it is nice to see a simple dessert that would work for a more mature party. I have never made fondant roses before but I do admit to making Tootsie Roll roses by taking bits of Tootsie Roll and warming them up in my hand and making them pretty much how you show in your video. I don’t know why I do that…I guess I like to play with my food! Hi Heidi, thanks so much, what a great idea with the Tootsie Roll, I guess it is pretty well the same sort of texture so it would work. This cake is awesome! I love everything about it. Thanks so much for participating in the series this year! Great post! Thanks Alli, and so happy to be participating.